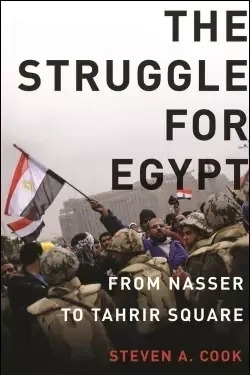 "There is a tendency to believe that Egyptians rebelled against Hosni Mubarak.... That is true, but it is not entirely accurate," writes CFR Hasib J. Sabbagh Senior Fellow for Middle Eastern Studies Steven A. Cook in The Struggle for Egypt: From Nasser to Tahrir Square. He argues in the book that Egyptians "revolted against a regime—a political order" that, while led by Mubarak for three decades, was one he had inherited from former presidents Anwar al-Sadat and Gamal Abdel Nasser. Cook, who was in Cairo when the revolts broke out, provides one of the first historical analyses explaining the reasons behind the uprising, which he calls "if not predictable, inevitable." The political upheaval of spring 2011 stemmed from the "intense debate to define what Egypt is, what it stands for, and what its relation to the world is." Cook notes in a related Foreign Policy article that for the first time Egyptians can openly debate the structure of their social and political systems outside the "circumscribed contours of an authoritarian political system." Cook traces the "stirrings of Egyptian nationalism" back to the 1880s and culminates his narrative with the events in Tahrir Square in early 2011. He chronicles the end of the British occupation, the emergence of the Muslim Brotherhood, the rise of Nasser and his quest to become a pan-Arab leader in the 1960s, Egypt's decision to make peace with Israel and ally with the United States, the subsequent assassination of Sadat in 1981, and the revolution that overthrew Mubarak. Cook explains that Egyptian politics have been influenced by internal forces such as Islamists, Nasserists, and liberals, in addition to pressures from the "foreign component"—in particular, the United Kingdom, the Soviet Union, and the United States. It is against this complex ideological backdrop that Egyptians are trying to answer central questions about their national identity: What principles and values should guide Egypt at home and abroad? What is the role of religion and nationalism in the life of the country? While there is "great hope that the Egyptians can construct a new political system and rebuild their society peacefully, that is unlikely as long as the underlying and antecedent debates about Egypt and what it stands for remain unresolved," asserts Cook. With the fall of Mubarak, Cook stresses that the United States should "come to terms with the end of the strategic relationship" with Egypt. He adds that Washington "risks playing a malevolent role in the transition if it tries to interfere. This is not only because of the mistrust many Egyptians have for the United States, but also because the trajectory of Egyptian politics is unknowable and is likely to stay that way for some time." He concludes, "Against the broad sweep of contemporary Egyptian political history, the demands for change from Tahrir Square are yet another manifestation of the struggle for Egypt that has been going on since at least the late nineteenth century." Visit Steven A. Cook's Facebook page. Follow Steven A. Cook on Twitter (@stevenacook). From his wanderings on the Arab streets of Cairo (and dozens of other Arab and Turkish towns), Cook brings the revolution to life. But he does so with the depth of knowledge of someone who has understood the dynamics of Egyptian--indeed, Arab autocracy--for years. Tell[s] the story of Egypt in rich detail, beginning with Nasser and on to Sadat and Mubarak. Incredibly vivid . . . the single best book on Egypt. Jumping from the chaotic byways of Cairo to the highest reaches of international diplomacy, this providentially-timed account of modern Egyptian history combines immersion journalism with insightful policy analysis. A Senior Fellow at the Council on Foreign Relations, Cook translates an insider's perspective for a general readership. A timely, well-researched and lucid political history that sweeps back to the origins of the praetorian dynasty that has ruled Egypt since the 1952 military coup. With meticulous historical context and the acumen of a political scientist, Cook . . . weaves together a narrative drawn from archives, interviews and his own firsthand reporting during a decade of visits to Egypt [and] offers invaluable insights to anyone interested in how Egypt came to its present impasse . . . a substantial and engaging book. [A] detailed account of the build-up to revolution and how recent developments were organized . . . Cook, who is intimately familiar with Egypt and its political and cultural history, begins from Nasser's 1952 coup, providing broad context for his discussion. A sweeping history of modern Egypt. . . . A reliable single source for understanding the flow and complexities of Egyptian politics, especially since the 1952 revolution. Exceptionally timely. . . . An accessible, knowledgeable, fair-minded, and very useful examination of the last sixty years of Egypt's political history, including moments of great pride and decades of deep frustration. Anyone pondering the challenges and opportunities confronting Egypt--and Egypt's allies--after the January 25th Revolution would do well to start with this lucid account. Hassan was giddy, a word not often used to describe him. Not only was he relieved that Egypt's long nightmare had finally come to an end and the prospects of freedom were seemingly better than at any moment in the previous six decades, but Hassan must also have felt vindicated (though he is too polite to boast about it). He was not among the organizers of the protests and his activism had not been as high profile as many others, but Hassan had worked tirelessly to raise awareness among his network of Egyptian and foreign contacts of the perfidy of the Mubarak regime. He was also entirely correct on another level, having little patience for the claim that Egypt's political system was stable and thus durable. Hassan argued quite the opposite; that it was a house of cards built only on a foundation of fear, which was meaningless once Egyptians could no longer be intimidated. He could not predict when that would happen, but he believed it was inevitable. "I believe a big conspiracy is being perpetrated against the people of Egypt. Following almost three weeks of nationwide protests leading to the apparent downfall of a dictator, jubilation fills the streets of Egypt, in effect drugging the people into believing they have really become free. They are convinced their interim government will really keep its promises and steer them peacefully to the democracy everyone so valiantly fought for . . . Egypt will remain a military dictatorship indefinitely. How I wish I am wrong." This message was surely a result of that "revolutionary hangover" that observers had expected. After all, uncertainty breeds fear. Yet in the weeks and months after Mubarak's departure, Hassan remained deeply concerned over the ebb and flow of events. Most of all, he was suspicious of the senior military commanders, whom he quite correctly tied directly to Mubarak. They were, indeed, his officers and while they ultimately pushed the president from office, they were loyal to him to a fault. Mubarak had threatened their cherished order nine days before his departure when he released thugs on Tahrir Square, yet the military stood aside during the chaos and stuck with their dictator. To be sure, there were bright moments for Hassan. For example, when the revolutionary groups forced the resignation of Mubarak's last prime minister and loyal servant, Ahmed Shafiq, on March 3, Hassan's outlook improved considerably. He was under no illusions, however; he never believed that Egypt's transition would be easy, but he was also well aware that remnants of the National Democratic Party, elements of the police, state security agents--even after the State Security Investigations was abolished on March 15--business interests, and the military would do whatever they could to salvage the old regime. That is why he voted "no" in the March 19 referendum. Hassan, like the many others who rejected the amendments, feared that previously well-organized and well-funded groups would be in a better position to contest parliamentary elections in six months time than groups confronted with the job of transforming themselves from protest movements into political parties--no easy task. Indeed, there was nothing about the post-Mubarak order that would be easy, but many Egyptians firmly believed that whatever the outcome of their revolution it had to be better than the Mubarak era. There is a tendency to believe that Egyptians rebelled against Hosni Mubarak in early 2011. That is true, but it is not entirely accurate. They revolted against a regime--a political order--that he led, but that Mubarak inherited from Sadat who had inherited it from Nasser. It was a system that was founded in the ideological and power politics of the early 1950s, when the Free Officers discovered they could dispose of their opponents through nondemocratic laws, rules, regulations and decrees. Egyptians unexpectedly cracked open that regime and dislodged its caretaker--Mubarak--and for the first time in sixty years have an opportunity to define Egypt as they desire rather than as a line of now discredited military officers have defined it. All the questions that Egyptians have been asking themselves: What is Egypt? What principles and values should guide Egypt at home and abroad? What is the role of religion and nationalism in the life of the country? What kind of foreign policy should Egypt pursue? Can Egypt be a regional leader again? Suddenly Egyptians--through their own bravery and dignity--gave themselves an opportunity to provide their own answers to these questions. Without a compelling and coherent account of Egyptian society and politics in response, their extraordinary efforts could be for naught. Indeed, it is entirely possible that Egypt's elections, the seating of a new parliament, or the inauguration of an elected president may ultimately not matter much. Although among the vast majority, there is great hope that Egyptians can construct a new political system and rebuild their society peacefully, that is unlikely as long as the underlying and antecedent debates about Egypt and what it stands for remain unresolved. There is no way of knowing how this process will unfold or how long it will take. In the immediate post-revolutionary period it is clear that the contest over legitimacies is the first step in what will likely be a bruising battle to define Egypt. Consequently, it is extraordinarily difficult to determine how the country will end up. There are only hints, albeit mixed ones--positive developments about democratic change coinciding with ominous signs of authoritarianism. For now, one thing is clear: the struggle for Egypt continues. Copyright © 2011 by Oxford University Press. All rights reserved.